Readers familiar with Yogi Berra might comment that it's déjà vu all over again, as it has been not even two years since Deutsche Grammophon devoted a two-CD compilation to Beverly Sills. 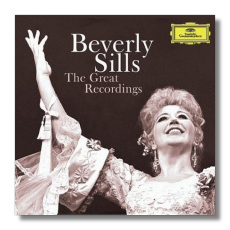 That one was called The Art of Beverly Sills (DG 471766-2), and it included 134 minutes of excerpts from "Bubbles's" operatic recordings and recitals. The Great Recordings does not copy a single note of what was on the earlier compilation, which is good, but I must grumble that the result is that Sills' Mozart and Richard Strauss record – one of my favorites – now has been divided between two separate releases and three separate discs, and that excerpts from her complete recordings of Manon and Hoffmann are similarly scattered. So much for continuity! Perhaps DG will repackage the two 2-CD sets and reunite the divided material. Better yet, perhaps they will embark on a comprehensive "Sills Edition" of everything they can get their hands on, and release it at a very reasonable price! Having said that, The Great Recordings contains some wonderful highlights from complete recordings not everybody will want to (or be able to) splurge on. Some listeners might want to give Donizetti's complete Roberto Devereux a pass, but this new compilation includes that opera's slam-bang finale, in which Queen Elizabeth, having unintentionally caused the beheading of her beloved Robert Devereux, the Earl of Essex, goes a little bit mad. Donizetti let out all the stops here, and Sills gives as good as she gets, spitting out her vitriol and injured pride in a performance whose dramatic impact would have made Maria Callas proud. As with the earlier compilation, this is a fairly faithful portrait of Sills' career – from The Ballad of Baby Doe to her retirement from singing in 1979. What's missing is her Handel Giulio Cesare (RCA Victor owns that!) and the many roles of which she never made commercial recordings. Fortunately, live recordings of many of those are available in the dark back rooms frequented by opera mavens! The booklet includes a brief interview between Sills and Anthony Rudel, son of conductor Julius Rudel, the soprano's long-time collaborator. 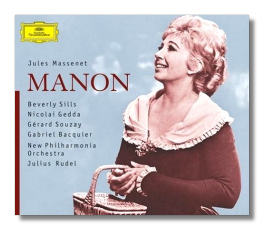 Sills obviously looks back at Manon – specifically, her New York City Opera performances with Julius Rudel – with great fondness and pride, and it was inevitable that she and the conductor would record it.Sills' 1970 recording of Manon has an interesting history. First it was released on the now-defunct ABC label, then it went to EMI Classics/Angel, and now, after being out of print for several years, it has resurfaced on Deutsche Grammophon. (Recently I saw a used copy of the EMI CDs selling for $120!) DG has digitally remastered it using the best technology available, but the engineering continues to be problematic. All Saints' Church in Tooting sounds more like a deserted train station; the recording is reverberant, glaringly bright, and shallow. Fortunately, the performances make those concerns go away. Sills had been singing Massenet's heroine since 1953, and by 1970, she had arrived at a near-definitive interpretation. She moves convincingly from Manon's naïveté in Act One to her empty splendor in Act Three, her self-destructiveness in Act Four, and the pathos of her death in the last act. It is the mark of a great portrayal when even small moments make a large impact – for example, her audible shudder of pleasure in Act One at the idea of living "à Paris" with her Chevalier. Not everyone responds to Sills's singing (and speaking) voice, and I suppose that this is the most controversial feature of this Manon, but for those who are responsive to her timbre, throw caution to the winds. ABC assembled an unparalleled cast around Sills. Gedda is his usual charming and smiling self as the Chevalier des Grieux – and, when required to be, he is suitably anguished. He is hardly less authentically French than Gabriel Bacquier, who sings the role of his father. As Manon's cousin, Gérard Souzay is a piece of luxury casting, and Nico Castel and Michel Trempont make appropriately nasty impressions as Manon's would-be suitors. On his classic monaural recording with Victoria de los Angeles and Henri Legay, conductor Pierre Monteux was more subtle than Julius Rudel, but perhaps some of Rudel's niceties are lost in the sonic haze. Ten years after the opera's première, Massenet composed an alternate aria for Manon in Act Three – a so-called "Fabliau" which presents the heroine in a more reflective light than the more familiar Gavotte. I can understand why the Gavotte is preferred, yet the Fabliau is not musically inferior. The original LPs included it as a ten-minute appendix after Act Five, and it has been retained here in that position. (It would be redundant to perform it where it belongs, unless the Gavotte is omitted.) Unwitting listeners might be fooled into thinking that Manon has been resurrected from the dead!